BotÃ¡ni, a brand of botanical skin care from Australia, has contributed five sets of their Olive Skin Serum and Soothing Facial Mist worth S$330 to the VivaBella Green Beauty Box Giveaway. I wrote about this range recently and mentioned that their products looks rather promising, especially for those with particularly sensitive or problematic skin as BotÃ¡ni range of products are toxic-free, formulated with skin friendly and organic active ingredients to address skin issues and imbalances. Created with natural emollients, moisturizing actives, botanical extracts, plant-based emulsifiers, as well as natural detergents and humectants, products from BotÃ¡ni are free of mineral oil, paraffin oil, petroleum jelly, lanolin, sulfates, propylene glycol (PEGs). And instead of parabens, the company uses plant based preservatives such as potassium sorbate and grapefruit seed extract. The products are also cruelty free and vegan friendly as the company do not use animal derived ingredients such as beeswax but use rich olive waxes in place. Additionally, some of their formulations are completely wheat and gluten free. The BotÃ¡ni skin care range now includes over 20 products and the products are even used by health care practitioners. What impressed me is that many of BotÃ¡ni’s products use Aloe Vera as the base and other notable ingredients in their formulations include Olive Squalene, Olive butters, Jojoba oil, Olive Leaf Extract, Calendula, Arnica, Liquorice Root and Beta-Glucan, amongst others. The prices also look reasonable and some products are even affordable, considering that the formulations are said to be concentrated and only a little need to be used each time. What is also noteworthy about BotÃ¡ni is the combination of the founder’s naturopathic holistic approach to skin health and expertise with leading industry professionals in Microbiology and Cosmetic Chemistry to ensure performance, safety and efficacy of their skin care products. In fact, all BotÃ¡ni formulations are rigourously tested for safety and results, and their products are stated to be gentle enough to care for the most sensitive skin types, even for babiesâ€™ skin. I wish someone will bring this range into Singapore! Do ‘Like’ their Facebook page to stay tune to their updates and promotions. 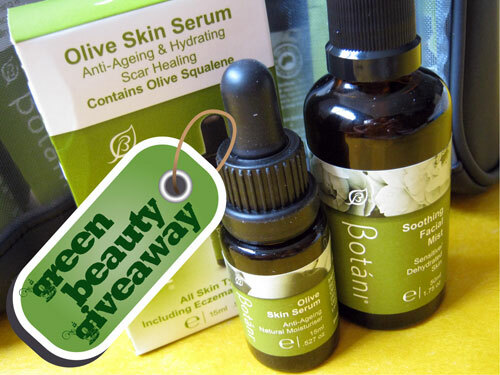 And if you want to win one of these packs consisting of their Olive Skin Serum and Soothing Facial Mist plus the other Green Beauty Box goodies, go explore theÂ BotÃ¡ni websiteÂ and tell me what you think about their Olive Skin Serum. You can also tell me what other products caught your eye if you like. 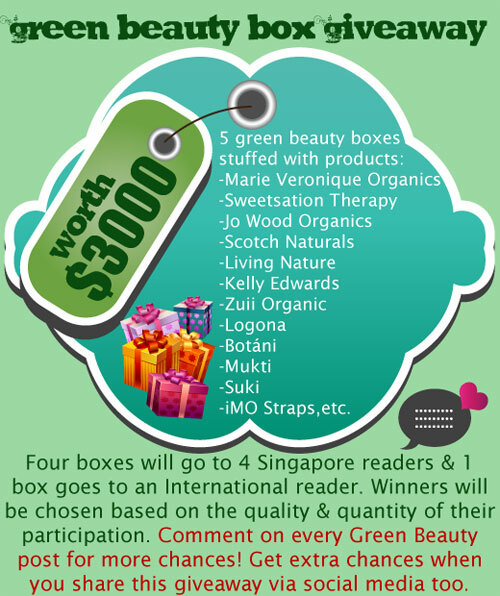 This is the last week where I’ll post all the sponsored items for the VivaBella Green Beauty Box Giveaway. Just two more brands and we’re done. Then I’ll call one finale just to know who is participating and where are you from to facilitate the selection of winners as four will be picked from Singapore and one from another country. 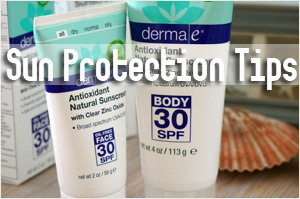 Previous Post: « Do alcohol in sunscreen cause photosensitivity? Wow, BotÃ¡niâ€™s Olive Skin Serum looks like an impressive product indeed. I may have taken biology back in secondary school but this is actually the first time I’m hearing of this “Squalene”, and they make perfect sense: What better way to restore my skin’s natural moisturizing and protective properties than to feed it with more Squalene, in this case, the Olive Squalene from this fantastic BotÃ¡ni product? Definitely something I would love to have lying in my skincare pouch. The rest of the range of their items look great as well. Would love to give their face treatment products (lip balm, eye cream etc.) a go. 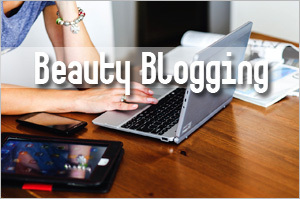 I have been battling with rosacea all this while. I hope Botani Olive Skin Serum with its anti-inflammatory, anti-fungal, anti-bacterial and tissue healing properties of the Serum will change my skin back to normal, no longer itchy or red with rashes. I had like their FB page & retweet your tweet for this giveaway. I think Olive Skin Serum containing olive squalene is an effective serum that will protect, heals and beautify the skin. I like the BotÃ¡niâ€™s Skin Rescue Kit as it will help to make my skin healthy and heals my pimples. Looks like this Olive Skin Serum treats all my problem. Well, i would say most of my problems. I’ve also been reading about this serum and it seems that it has a lot of high reviews. Olive Squalene is the key. This serum is not only a serum but it’s also a natural moisturizer. Would love to try this product out and see how this works on my skin. Thanks to introduce this natural brand! Olive has abundant skin care benefit and yet non-expensive, no wonder it’s popular ingredient in many skincare products. Botani Olive Skin Serum uses 100% pure olive squalene to achieve healthy skin and it can be used alone after cleansing or add 1-2 drops to each application of moisturizer and eye treatment. It’s a simple serum to keep skin healthy at affordable price. Besides the Olive skin serum, their body range sounds ideal to my skin dermatitis! I have more skin rash irrupted this year and forced me to look into my daily diet more strictly. I had a big flare up on my hand earlier this year and found my skin care products were unable to soothe and heal the critical skin condition, including natural moisturizer/oil that I had on hand at that period. The natural care I used wasn’t 100% pure, meaning it contained minimum chemical. Then my mom gave a a 100% pure moisturizer (also AU made) but it contained natural ingredients that might be disturbing the healing process and my skin dermatitis actually got worsen with it. At the end I had no choice but used doctor prescription chemical cream. Quite an upset experience.., I wish I have Botani treatment-focused Olive balm at that time to ease the skin itchiness, redness and roughness. Their products are also safe to use during pregnancy and for baby skin, so I could imagine it will be helpful for skin rash as well. I also interested in their Phytoseptic treatment, sound good to treat small rash. I prefer the use of serums to moisturizers because it contains a higher amount of active ingredients and the skin reacts faster to it. I’ve heard of Olive Squalene but I hadn’t got a chance to try it. Knowing that it’s similar to the sebum that our skin produces, so it can effectively replenishes the moisture level in aging skin where aging skin tends to produce lesser sebum and cause dryness. Actually, Olive Squalene doesn’t just moisturize the skin, it does in healing cracked skin, soothes irritated skin and have antimicrobial properties to prevent acne formation. I believe, so as long you keep your hands away from your face, cleanse with slightly acidic products and moisturize adequately, your skin will behave. But to let your skin glow, you need good serums to give an extra boost to your skin. I totally enjoy using Kiehl’s midnight recovery concentrate but would probably try something else to find the product that suits my need and reduce the number of products I use. Other product that interests me would be the facial mist as I’ve been using a facial mist during the day when I’m out in the sun. I mix lavender EO with witch hazel or the commercial rosewater spray, spray on my face and neck and pat it dry with a tissue. This helps to cool down my face but I think it’s not advisable for those wearing makeup as this Natural Facial Mist is ideal for makeup removing. It’s gonna be expensive just to use this for cooling down, it’s better to try it rather than thinking about buying it all the time. I’m a fan of their FB page and I’ve also RT-ed your tweet for this giveaway. I love olive oil. It is essential part of my diet, but I haven’t used products based on it for my skin care yet. This Olive Skin Serum looks very attempting with only few ingredients which minimize any allergic reactions. As I understood, It has light consistency and no oily feel on skin. I would like to try it. There is more product in Botani range I would like to check, like Rescue Eye Treatment or Spirulina Salt Scrub for body. Well, I just love trying new products. I want this Olive Skin Serum for my dear princess. She is 11 with sensitive skin so this should be the right products for her. 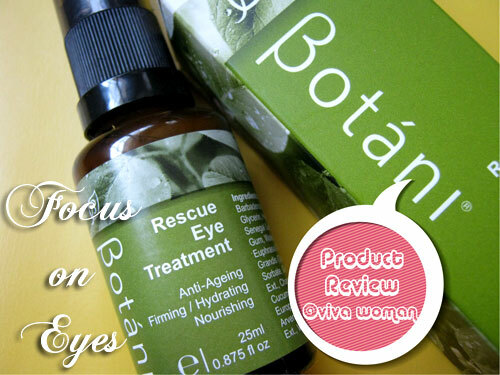 I am very attracted to the benefits of the Olive Oil Serum that are listed on Botani’s website. Reduces the appearance of scars? Immediate hydration boost? Sounds really good to me. Almost too good to be true. I’m always careful about claims and so I checked out the ingredients. I am absolutely floored to find that it contains only 3 ingredients: Olive Squalene, Vitamin C, Vitamin E! Knowing that Vit E helps with scars and is a natural preservative, I am convinced the benefits listed have basis and are not just claims. I’ve never heard of ‘Squalene’ so I read it up on cosmetic dictionary, in Botani’s website and wikipedia. I’m amazed to find that this compound is found in human sebum too. I think the use of olive squalene is ingenious. 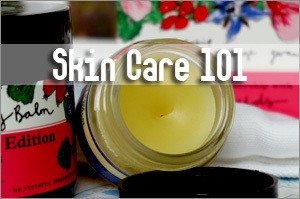 It uses similar compound products by the skin to hydrate the skin! I will be looking out for this ingredient in the future. I’m happy with the ingredients and the price. 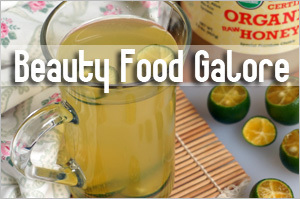 It’s great that each and every ingredient is absolutely beneficial for the skin. For the ingredient offered, the price is worth it. Olive Oil Serum is a product which I will spend my money on. I think I’ve just found THE serum. Thanks! Next, I gotta find out how to get it in KL. The Olive skin serum sounds pretty interesting. 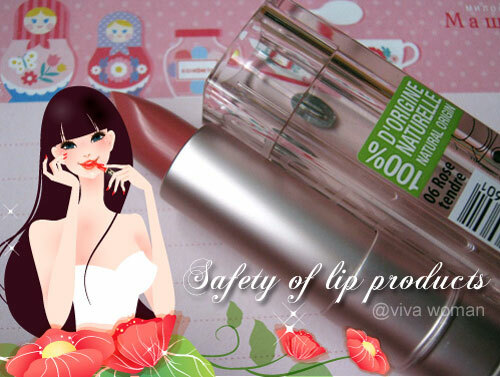 Considering that it consists of only 3 ingredients, Olive Squalene, vit C & vit E, makes the item more attractive. Pretty tired of all the long list of ingredients that are listed on whether commercial or organic products, in which half the time are mainly preservatives or perfume, which you do not know if it’ll irritate your skin in the long run, or work against other products. It’s time for me to start on anti-aging products, and what better way to start off on it with the Skin Serum? I’ve heard and read a lot about the goodness of olive oil for skincare and haircare uses, but I’ve no experience with using olive-based products. So this brand is interesting since it precisely leverages on the natural healing properties of olives. It’s also interesting how Barbara developed the Rescue Acne Cream and even the scientific efficacy data of how much bacteria it can kill is on the website! This is impressive as it really shows good-quality R&D. I would really love to try this cream since it is benzoyl peroxide free. olive oil is really versatile isn’t it? we can cook with it. we can eat it. we can use it as natural lubricants. and it can be used directly on the skin or made into awesome skincare or haircare! I especially like using olive oil in making cold process soaps ‘cos it’s really mild and good for sensitive skin. olive oil is high in monounsaturated fatty acids and Vit E.
The simple three ingredients for the skin serum is just olive squalene, vit C and vit E. Olive squalene not only moisturizes naturally. It is very similar to human squalene which cannot be produced in large quantities in the body. It is also an antioxidant which helps to fight free radicals. Vit C is also a very potent antioxidant and is an essential component in collagen synthesis. Vit E is yet another antioxidant used in skincare to prolong the usage lifespan of skincare products and it has great anti-ageing qualities! I’m actually more and more convinced that this would be a very simple skincare product to include into our daily skincare due to its very simple ingredients and a grand total of 3 ingredients in high concentrations. I’m also amazed that there are no preservatives used in this product. I’m thinking their production line must be very very hygienic and we’ll have to use this product up within 4 months of opening! 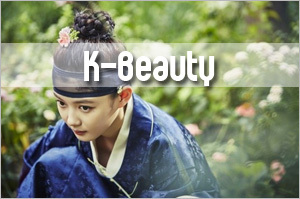 I would like to try their Purify Facial Cleanser! It’s full of my favorite skincare ingredients and smells. It has aloe vera(hydration), grapefruit(balancing), echinacea(immunity boosting), calendula(calming), chamomile(soothing), lavender(soothing), teatree(antibacterial), vit e(anti ageing). I really do admire how this brand has come about. 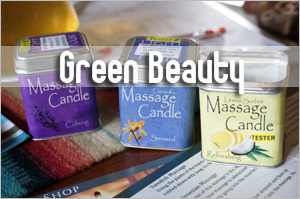 The whole emphasis on olives, specialised R&D with products that are properly tested and its ecofriendly practices! It’s great that this brand has olive as their main ingredient, since it has so many wonderful properties, not only for internal health. I would like to give it a try to the Skin Rescue Kit since it claims to control blemishes without harsh ingredients such as BP and moisture dry skin as well. This last one is good considering that acne-prone skin not always is super oily, specially when you are 3o or older. It also would be very interesting to try the olive skin serum since it claims it seems to be an “all in one” product. It targets many skin issues such as scaring, wrinkles, dryness, sun damage and even stretch marks! I also liked that the products are pregnancy safe, since many women would want to have an effective skin care that would be safe for use in this period. Olive Skin Serum is formulated with pure squalene derived from olives, which is a natural moisturizer. It has been known that there are many beneficial effects of olives. The vitamin E in olives is an antioxidant and can help hydrate skin. It is said that the serum can reduce scars and age spots and lock in moisture to make skin look youthful and soft. I would love to try this premium product! I would also like to try the Olive Soothing Cleanser. 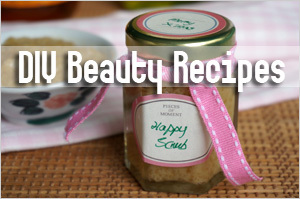 It is suitable for my sensitive skin and can be used as a make-up remover without stripping the skinâ€™s natural oils. The cleanser is so gentle that it can be used on babies, too! Nearly 10 years ago I suddenly developed Discoid Lupus Erythematosus. However up until 5 years ago, I had been using chemical laden products until my skin was severely irritated. I decided to find natural products, which I did at Sasa. It wasn’t BotÃ¡ni though. The products I bought at Sasa were good but the problem was that I had to ask my friends in KL or Penang to buy them for me. So my quest for easily available natural products began. I discovered BotÃ¡ni through internet search. At first I wasn’t really interested since their products are olive based (I have bad experience with olive oil, those cheap and chemically infused ones, that is). Then, after a series of intensive search, it seemed like only BotÃ¡ni is suitable for my skin, I decided to buy one item to test. It was Rescue Acne Cream and I bought it in April 2011. 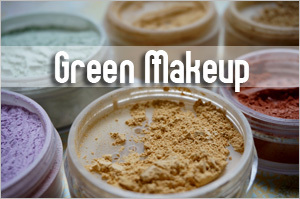 My skin was prone to breakouts, instead of dabbing the cream on the acne, I smeared the cool green cream thinly on my whole face. The breakouts lessen and my skin becomes less irritate. June passed, and I discover no DLE lesion developed on my face, although they do form on my back, my scalp and in my ears. By August, the cream is running out and I decided not to refill my annual steroid prescription. Instead I bought Olive Skin Serum and Olive Repair Cream. Although now is only December and I have been using these two product less than 4 months, I discover my skin is glowing, optimally hydrated, no longer burns under the sun even though without sunscreen, and the best of all the scars and blemish are fading albeit slowly. Now, I donâ€™t mind being outside under intense sun because my skin doesnâ€™t hurt and burns anymore. I also use these two products on the DLE lesions that form on my back, scalp and in my ears. They havenâ€™t disappeared yet. But they no longer hurt and is becoming smaller (Alhamdulillah ïŠ). I really hope that I can combat the lesions using these products as I hate the side effects those drugs have on me. My facial mist, facial wash and scrub (bought at Sasa) are running out. I canâ€™t wait to buy the Soothing Facial Mist, the Purify Facial Cleanser and the Exfoliating Facial Cream. The last few months, I feel that my legs are getting dehydrated despite light moisturisers used almost daily. This has also impeded the fading of these scars and marks on my legs. Which also means my hemlines are getting longer too. I’d like to take along the PhytoBody Lotion 250 ml and Olivene Balm 50g with me on my upcoming dive trips. The Olivene balm to dab on fresh spots and light scratches, with the PhytoBody Lotion to seal in all the goodness and nutrients my skin needs at night to rejuvenate itself and lighten the scars. While I’m still iffy about using olive oil on my face, my legs are definitely in need of some deep moisturising. Plus, these 2 products come with anti-bacterial properties and healing ingredients, the perfect combination my scratched and bitten legs are seeking! I like the idea behind the formulation of their products because too often, you find out certain “natural” products are actually just random cocktails slapped together in a lab or even someone’s kitchen, with little testing. Also, their formulations seem very nice but don’t really seem too rich. Especially in humid climates like Singapore, the last you need is something oily enough to clog your pores and even possibly irritate your skin. Note:their site seems a bit broken, so I had to obtain the ingredients list from other sources. Their Soothing facial mist sounds good and with no alcohol or witch hazel extract, it would be soothing for my skin which is quite sensitive. As for the Olive skin serum, it seems very simple and not too complex, unlike some ingredients lists with up to 50 ingredients. From user reviews, I’ve heard quite a few good things about this product including its ability to really heal the skin and that it seems to be even suitable for oily skin or even problematic skin. 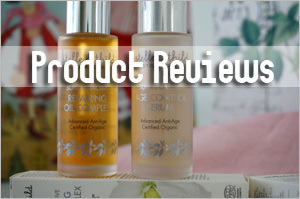 Based on user feedback, I suppose that the oil and other ingredients seem to be extracted and processed in a certain manner such that they’re safe to use and don’t cause any product reactions. Now, I doubt this product is some miracle product but I think it’d make a gentle moisturising serum. The 1 product that I actually zoomed in was the Olive Skin Serum. I have dry skin, according to my beautician. Dry on the surface and oily beneath. I think this serum would be great for me as it provides immediate hydration which is just what my skin needs. The extras benefits is that it would help reduce appearance of scars (therefore ridding my scars caused by pimples) and age spots, soften fine lines and wrinkles, which are starting to make their marks on my face. With this product, perhaps my face would get the hydration it needs as well as heal the scars on my face. To those who have been battling excessive oil, blemish, sunburn, psoriasis and other numerous skin problem, drop those chemical laden products you are using and try BotÃ¡ni Olive Skin Serum! You will see why this particular product is the heart of BotÃ¡ni. I had bad experience with mineral oil infused olive oil when I was younger, so I wasnâ€™t really impressed with this serum when I came across it. However since I was in dire need to threat DLE lesions on my back, scalp and in my ears without any (more) steroid, I thought â€˜oh wellâ€¦ letâ€™s give it a tryâ€™. The serum arrived with Olive Repair Cream that I also ordered. It was already noon. It stated that I need to apply the serum only on clean and moist skin. Since Iâ€™d already washed my face that day, I decided to use it at night. That night, before bed I followed my cleansing ritual but this time after misting my face with Caudalieâ€™s Organic Grape Water (this is one great product but since it is hard to find Iâ€™m switching it with BotÃ¡ni Soothing Facial Mist), without much faith, I put on 2 drops of BotÃ¡ni Olive Skin Serum. I didnâ€™t use the cream yet since it stated in their website that it is better to treat skin problems with the serum first. I woke up the next morning without giving any though on my skin. Only when I was about to brush my teeth I noticed my face wasnâ€™t greasy like usual. It was slightly oily, but not uncomfortably so. Then I noticed the cold sore infections on both sides of my mouth were drying and no longer hurt. My lips too were moisturized and they were no blackheads on my nose like usual, Alhamdulillah! That morning with renewed enthusiasm, I used both the serum and the cream. They are now my daily beauty regime. I even ditched my petrolatum lip balm since my lips are no longer dry and cracking. I havenâ€™t use oil blotting paper ever since I use BotÃ¡ni Olive Skin Serum and Olive Repair Cream. They moisturize my skin optimally, and I feel so happy that my face is not greasy anymore. I also have no need to buy a sun block or sun screen (save more money 🙂 ) since my skin no longer burns even under intense heat for prolong period of time. In fact, no more stabbing pain every time Iâ€™m exposed to the sun. My sun-burnt skin is also healed, the same goes to the scars and blemishes â€“ they too are healingâ€¦ and my face glows the first time in years! I also put 2 drop of the serum into a small bottle of good quality of olive oil and use it to moisturize my body. The blemishes there too are slowly fading and my skin tone are evening out, including my hands that are exposed to harsh sunlight through the windshield. Next in my shopping cart – BotÃ¡ni Soothing Facial Mist, Purify Facial Cleanser (why oh why the 100ml size is not available in Malaysia?) and the Exfoliating Facial Cream. Olive Skin Serum is 100% plant based and formulated with pure squalene derived from olives. I’m curious what is squalene which I read up more : http://en.wikipedia.org/wiki/Squalene. Squalene oil is the most common fat and antioxidant produced in and on human skin. It is a natural moisturizer and has low acute toxicity, and are not significant human skin irritants. This is a good serum , and its good for sensitive skin too. It locks moisture into skin and delivers oxygen into skin with antioxidant as well. And its paraffin, mineral free, petrochemical free. Its a reliable skincare which we can trust with optimal result. I think it is pretty good as it contains ingredients that are very close to what our skin naturally produce. Its benefits are very good, I personally like the fact that is balances skin tone as I have very uneven skin tone. If my skin tone was even I wouldn’t need foundation! The less the better. I really liked their range of products and ethics (there has to be a Greek guy or gal somewhere in their team judging from the name!) and I was very drawn to their Olive Repair Cream. It seems to me one of these products that can be used from different ages or skin needs and still be able to see the results in the mirror (and in the eyes of the others!). I had bought the olive cleansing soap while I was holidaying in Melbourne. Its gentle and non-drying formula is right for my skin and for my family and the price is affordable. I’m looking forward to discover other products under this range. Preferably, the olive skin serum, 100% plant-based using key ingredients ‘olive squalene’ to treat dehydration, sensitive skin and skin prone to scarring. 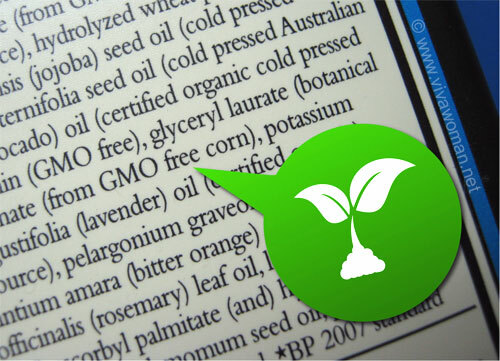 Botani respects the integrity of our skin and developing products that are not only safe but effective. Wow, my sensitive, slightly problematic skin definitely needs this! I don’t really know what to say about the serum besides that it seems absolutely amazing for the skin. I actually would love to try out any of their products. They seem so great. this sound promising!!!!! would love to try! I discovered MVO last year. It was rreccomended to me by a dear friend. Ever since Ibegan to use the product I notice my skin change. It made me feel good and I tell my friends about it all the time. Plus, it does not harm the environment which I give 2 thumbs up! I would most like to try the scar healing serum. I am a long time acne sufferer, I have many scars that I would love to have fade away! I’m not a fan of olive oil on my face…it seems though that the squalene in the serum can compensate the aversion (since I’m a huge squalene fan). I was trying to click the ingredients list but couldn’t get in. For sure – I would love to try the olive balm though. I think I saw this range while I was in Australia recently! Maybe I’ll go pick up some on my next trip! Wow the skin serum sounds magical XD 100% plant-based is always a big plus to me! And the fact that it is vegan-friendly is fantastic. I have a problem with dry skin on my cheeks and body and sometimes it gets so dry it itches, but I am not sure about what serums to buy that won’t damage my skin 😡 Plus, serums tend to be so pricey!! I also really like the cruelty-free and recyclable points. Recently I am trying to be much more conscious about not just the product, but the process and packaging. Being green all around! 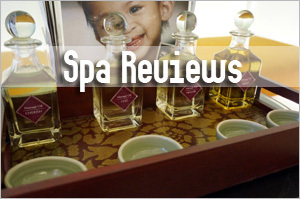 Who doesn’t need their facial skin soothed? – a blemish flare-up comes to mind. Botani’s Olive Skin Serum has Olive Squalene, which is the closest ingredient to replicate my skin’s own natural moisturiser. I tried it once (on sample), it absorbed perfectly well leaving no trace of oiliness/stickiness. My sister was recommended the Olive Skin Serum to help with her severe scars on her leg. Greeks have attributed their longevity and good health partially to olives. Botani uses olives a lot in its products, so am looking forward to having good skin from using Botani products! Even though I typically stay away from oil-based products (tea tree oil, cleansing oils) due to my skin’s inability to absorb their goodness, Olive oil is one thing that I’ve always loved (to use and to eat!) One of the home-made masks that I use frequently is simply olive oil and natural yoghurt as a homemade hair mask! Botani’s commitment to not including mineral oils and Paraffin oil, Parabens, PEGs, Petroleum Jelly and Lanolin and thorough testings done on all the products gives me the assurance that this is a quality product good for my skin. Another product that caught my eye and which I’d really love to try / hear a review on is the Rescue Acne Cream! I have many friends/family using medicinal acne creams that contains the key ingredient of BENZOYL PEROXIDE which I feel is very harsh on the human skin. The Rescue Acne Cream from Botani is BENZOYL PEROXIDE FREE and seems like the perfect alternative I’d recommend to my family! I love how their website is like MVO, it doesn’t just sell products, it dedicates a couple of pages to educating people about natural skincare tips. It’s also a bit interesting how they integrate the term “naturopathy” into skincare as it emphasizes their brand’s holistic approach to treating skin problems. So what do I think about their Olive Skin Serum? It surprisingly has very few ingredients for a serum. But it’s probably because it already has Vit C and E combo which from my experience is already potent enough. Been using the mix in my DIY experiments and the Vit C indeed works much better when I top it with Vit E oil. I’m interested to know whether it’ll fit my skin as for some reason, olive-based products have always done wonders on my body but when I start using them on my face, they usually trigger breakouts. So definitely, although a bit weary, I’m curious how this serum will perform on my skin–and if it’s safe to use around the eye area. And having said that olive oil-based products work well on my body, I’m interested to try the body oil. I would love to use it as a bath oil then after showering, use the Phytobody lotion to seal in the moisture. I suffer from KP so I need highly hydrating body oil/lotion which aren’t too heavy in texture. The Olive Skin Serum is free of paraffin oil, petroleum jelly and PEGs! I read from health magazine that these products cause pimples! Really glad the Olive Skin Serum is organic and it appear my sensitive skin would like it! I also want to try Botani Rescue Acne Cream. My polyclinic prescribes acne cream with 5% to 10% benzoyl peroxide, it usually causes skin peeling and redness. This acne is benzoyl peroxide free! And toxic free! Yahoooo!